Going down on bended knee in the middle of the road to propose. Wandering with ease across the street from shop to shop as the urge to splurge takes you. Or, if you are a retailer, seeing takings soar as the mall crowd grabs the chance to enjoy vibrant, open-air shopping. These are scenes from a pedestrian mall – well, three of them around town. Amid headlines about a recent proposal to turn part of Singapore’s premier shopping precinct, Orchard Road, into a pedestrian mall, SundayLife! looked at three streets that have already swopped cars for foot traffic. The three locales where pedestrians are king are Lorong Mambong in Holland Village, Smith Street in Chinatown, rebranded Food Street in 2001, and Albert Street in Rochor. Lorong Mambong and Smith Street are closed to cars part of the day. Albert Street, the grand-daddy of pedestrian malls here, having opened in 1998, is permanently vehicle-free. And from tourists to regulars to businessmen, the foot-friendly conversion has been a walkover success. Take Lorong Mambong, which was originally closed to traffic in 2002 for security reasons due to terrorism fears at the time. Today, the closure is still in effect, from early evening to dawn, but the vibe makes for one relaxed experience. The manager of Starker@Holland V restaurant, Mr Xavier Chung, 40, says his customers enjoy sitting by the road as it is the place to “see and be seen”. Part of the fun of dining or drinking in the area, he says, is looking across at the other restaurants and bars and “enjoying the view”. Providing an environment for suitors to publicly propose to loved ones might not be quite what the Orchard Road Business Association has in mind with its idea to regularly close off a 600m stretch from Scotts Road to Bideford Road. But going by how street malls elsewhere have fared, the outdoor ambience certainly clicks with shoppers and boosts retail sales. Most shop owners in the three locations told SundayLife! that they benefit from more walk-in customers, and some even experience a 30 to 40 per cent jump in business when the streets are closed. Along Lorong Mambong and Smith Street, which are lined mainly by eateries, businesses are very much in favour of closing off the street. Indeed, while Smith Street is currently only closed at regular times of the day, Mr James Ong, 47, executive director of the Chinatown Business Association, hopes the road can be permanently closed to traffic. He says restaurants along that stretch see a 30 to 40 per cent jump in business when the road is closed. “Many of the businesses tell us they would have more customers if the street was completely closed and ask the association to help them,” says Mr Ong. He says he is in talks with agencies such as the Land Transport Authority and Urban Redevelopment Authority, and hopes the road will be closed permanently in the next three years. On the other hand, managing director William Sun of Xiang Guo Li La, a restaurant in Smith Street, says road closures do not affect his business much because he mainly relies on regular customers as opposed to walk-ins, but he admits this adds to the vibe of the Chinatown area. “It makes it more vibrant at night, and the street comes alive,” he says. Mr Poh Chi Chuan, director of cultural precincts and tourism concept development at the Singapore Tourism Board, says that while the partial closure of Smith Street was for safety – given the concentration of diners and food stalls – it has proven popular with the public, which cite the “street-feel atmosphere” as the main draw. There is a downside to street-life style, though. At Holland Village, the road closure means less parking space in the area, says Mr Rash Shalla, 42, who runs a jewellery business there. But the chillout folk are not hot under the collar. At Wala Wala Cafe Bar, patron Handoyo Margono, 30, a service company director, says the lack of parking does not faze him. “Parking can be a bit overcrowded but it’s not inconvenient to park elsewhere and walk,” he says. However, he also noted that Orchard Road is a much larger road than Lorong Mambong, so closing it might not be a good idea as it could cause congestion. Aside from parking issues, business owners and customers seem happy with the way things are along Lorong Mambong. Jewellery shop owner Mr Shalla says he sees no need for the road closure to be extended beyond the current dusk-to-dawn hours. “It’s quiet in the daytime, and anyway, the delivery people need to drive to get in,” he says. Vietnamese tourist Thanh Nguyen, 27, who was tucking into chilli crab along Smith Street, which still allows traffic to pass through on weekday afternoons, agrees that not having to “keep looking out for vehicles” makes for a nicer afternoon dining experience. She adds that it would be good to have more sheltered pedestrian malls, but she was happy to brave the rain. Previously, pedestrians had to weave in and out of slow-moving traffic and put up with noise and exhaust fumes. A URA spokesman says business owners were initially worried that their businesses would be affected by the transformation of Albert and Waterloo streets, but it has “proven to be successful and beneficial for the businesses as the pedestrianisation has brought significantly more foot traffic to the shops along the mall”. 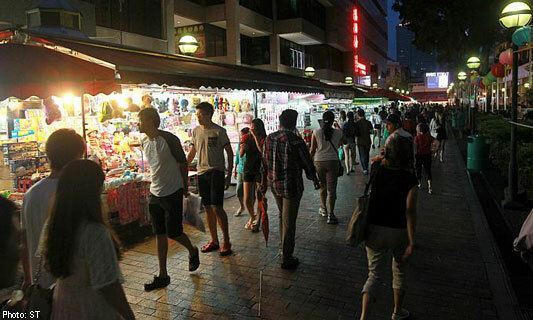 The spokesman adds that now, during festivals such as Mid-Autumn Festival and Chinese New Year, Albert Mall is abuzz with street bazaars and activities organised by the Kampong Glam Citizens’ Consultative Committee. She says the eatery also benefits from walk-in customers who see the crowds inside and decide to give it a try.